X-ray diffraction is a means of identifying crystalline compounds. It can be particularly useful when these compounds are very fine-grained components or mixtures. Two problems that were readily solved by x-ray diffraction analysis are discussed below. Talc is a major ingredient in certain cosmetic products. If it contains quartz or other abrasive minerals, it is unsuitable for cosmetic applications. 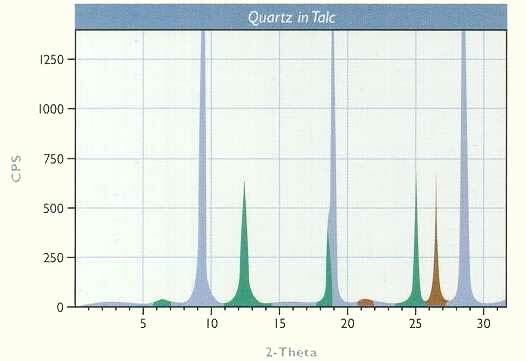 Chemical analysis cannot differentiate between SiO2 present as quartz and SiO2 present as talc. X-ray diffraction analysis is an easy and reliable way to ascertain the presence and quantity of quartz. The peaks in the x-ray pattern below reveal that a minor amount of quartz (brown), along with some chlorite (green), is present in the talc (blue). Through special procedures and with the use of quartz and talc standards, the amount of quartz can be quantitatively determined to levels of less than 1%. In other industrial mineral applications, health hazards such as respirable silica and asbestos in dust samples or products of commerce can be determined by x-ray diffraction. Crystallization chemistry is a complex science used in the production of compounds ranging from table salt and potash to borax and Epsom salts. Minute changes in the crystallization system can cause significant changes in the product that may not be detectable by chemical analysis or microscopy. 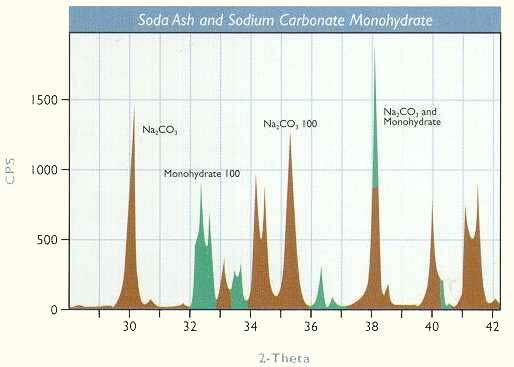 One project required that we determine quickly whether the particles forming in a sodium carbonate process were hydrated, anhydrous, or a mixture of the two. The pattern below was obtained by x-ray diffraction analysis and showed the presence of both forms. This permitted us to change the process to generate the desired product.